Famous for its rich history as a frontier cowtown, Dodge City offers up a wide array of legends, lore, and history to travelers in western Kansas. Once called home or visited by such notables as Wyatt Earp, Doc Holliday, Big Nose Kate, and Clay Allison, this old town had a reputation for being the most wicked town in the Old West. In 1865, Fort Dodge was established near the present site of Dodge City. During these rough times, the pioneers were often attacked by marauding Indians. The Fort offered protection to the wagon trains from the Indians, provided mail service and served as a supply base for troops engaged in the Indian Wars to the south. Major General Greville Dodge was placed in command of the 11th and 16th Kansas Cavalry Regiments and began work during the harsh winter of 1865, to repair telegraph lines and reopen travel routes. The Indians usually refrained from attacks during winter months. The long Santa Fe Trail between Franklin, Missouri and Santa Fe, New Mexico saw thousands of wagons pass as they traveled the Mountain Branch west of Dodge City along the north bank of the Arkansas River into Colorado. A shorter, but more dangerous route to Santa Fe was the Cimarron Cutoff, which crossed the river near Dodge City heading southwest to the Cimarron River. This trail was much more dangerous due to the vast spaces of waterless sand hills and increased risk of Indian attacks. In spite of all the hazards, this route was preferred by many traders and travelers because there were no mountains to be crossed and the distance to Santa Fe was somewhat shorter than the Mountain Route. 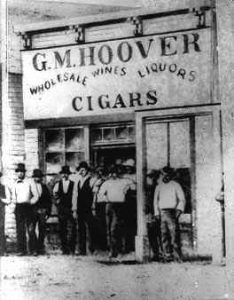 Soon, another man by the name of George M. Hoover would join Sitler, building Dodge City’s first business, a saloon built of sod and boards. On August 15, 1872, a group of businessmen from Forts Dodge, Riley, and Leavenworth, Kansas organized the Dodge City Town Company and began the planning and development of the town site. At first, the settlement was named Buffalo City until they learned there was already a town by that name, so it was changed to Dodge City, after the fort. 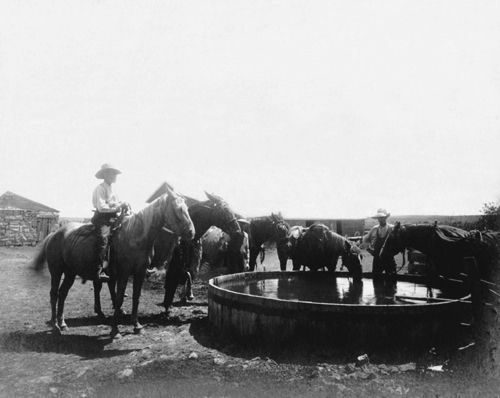 In the burgeoning settlement, there was initially no law enforcement and Dodge City quickly acquired its infamous stamp of lawlessness and gunslinging As the many buffalo hunters, railroad workers, drifters, and soldiers streamed into the town after long excursions on the prairie, they quickly found the saloons and the inevitable fights ensued. With the gunfighters dying with their boots on, Dodge City developed the Boot Hill Cemetery, which was used until 1878. Dodge City became the buffalo capital of the west and buffalo hides towered along Front Street awaiting shipment. Filthy buffalo hunters and traders filled the town’s establishment and the term “stinker” was coined. However, when General William Sherman, Army Commander-in-Chief, ordered the slaughter of buffalo in order to drive the Indians onto reservations, the prairie was littered with decaying carcasses. Though Sherman’s tactic of killing the buffalo was effective in winning the Indian Wars, it placed hundreds of buffalo hunters out of business. 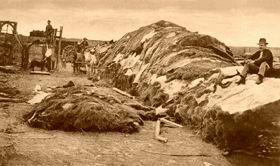 Most of the buffalo were gone by 1876, but over 1 ½ million hides had been shipped from Dodge City on the railroad. For years farmers, during hard times, gathered the buffalo bones and sold them for six to eight dollars a ton. The bones were used in the manufacture of china and fertilizer. Though the buffalo no longer offered a source of revenue for the townspeople, the cattle drives replaced the buffalo hunters. By the spring of 1876 the cattle trade had shifted west from Ellsworth and Wichita, Kansas, to Dodge City. As the Longhorn cattle from Texas were driven up the western branch of the Chisholm Trail to the railroad at Dodge City, the settlement was alive again. During the next 10 years, over 5 million head were driven on the trail into Dodge City. Cowboys at the water tank in Dodge City, Kansas. But the cowboys brought even more lawlessness to Dodge City and soon the mayor contacted Wyatt Earp, who was working as a Wichita lawman. Pleading for Earp’s help, he offered Wyatt the position of Chief Deputy Marshal with unheard of salary of $250 per month. 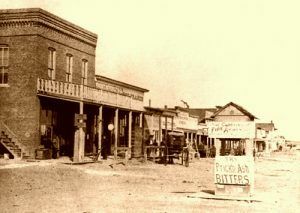 When Wyatt arrived, Dodge City’s population was 1,200 and 19 businesses were licensed to sell liquor. Marshal Larry Deger, the last of a long line of officers who had been run out of town or shot in the back by the lawless forces of Dodge, was overwhelmed and heartily welcomed Wyatt. Soon, four assistant deputies were hired — Bat Masterson, Wyatt’s old buffalo hunting friend; Charlie Basset; Bill Tilghman; and Neal Brown. Intending to restore order, one of the first things the new lawmen did was to initiate a “Deadline” north of the railroad yards on Front Street to keep the commercial part of the city quiet. On the north side, the city passed an ordinance that guns could not be worn or carried. On the south side of the “deadline”, those who supported the lawlessness continued to operate as usual, with a host of saloons, brothels, and frequent gunfights. The expression “Red Light District” was coined in Dodge City when the train masters took their red caboose lanterns with them when they visited the town’s brothels. The gun-toting rule was in effect around the clock and anyone wearing a gun was immediately jailed. Soon, Dodge City’s jail was filled. A tour are there places to stay? Hi Harold, we are not associated with Dodge City, but here is a link to the Dodge City Convention & Visitors Bureau that probably has the information you are looking for. So, Matt, Kitty, Doc, Chester, and Festus are all fictional. Hm. Okay.